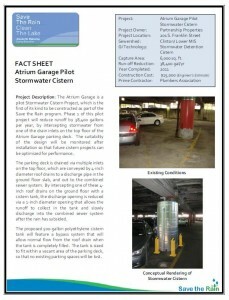 The Atrium Garage is a pilot Stormwater Cistern Project, which is the first of its kind to be constructed as part of the Save the Rain program. Phase 1 of this pilot project will reduce runoff by 38,400 gallons per year, by intercepting stormwater from one of the drain inlets on the top floor of the Atrium Garage parking deck. The suitability of the design will be monitored after installation so that future cistern projects can be optimized for performance. 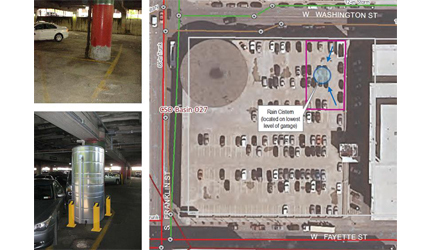 The parking deck is drained via multiple inlets on the top floor, which are conveyed by 4-inch diameter roof drains to a discharge pipe in the ground floor slab, and out to the combined sewer system. By intercepting one of these 4-inch roof drains on the ground floor with a cistern tank, the discharge opening is reduced via a 1-inch diameter opening that allows the runoff to collect in the tank and slowly discharge into the combined sewer system after the rain has subsided. 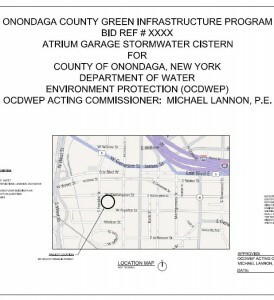 The proposed 500-gallon polyethylene cistern tank will feature a bypass system that will allow normal flow from the roof drain when the tank is completely filled. 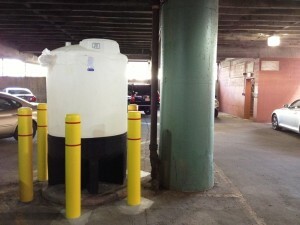 The tank is sized to fit within a vacant area of the parking deck, so that no existing parking spaces will be lost.